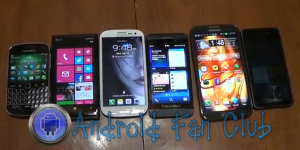 Folks at N4BB have created a video & design comparison between Blackberry’s latest Z10 (BB OS 10) smartphone with Nokia Lumia 920 (Windows Phone 8), Samsung Galaxy S3 (Android Jelly Beans), the monstrous Samsung Galaxy Note 2 (Android Jelly Beans), Blackberry Bold 9930 and Dev Alpha Z10 device. You can watch this design comparison video after the break. Blackberry Z10 appears to be an appealing business smartphone. However Samsung’s Galaxy series is working quite great for every sect of people. Let us know, which device appeals you more in terms of design and performance in the comments section below.